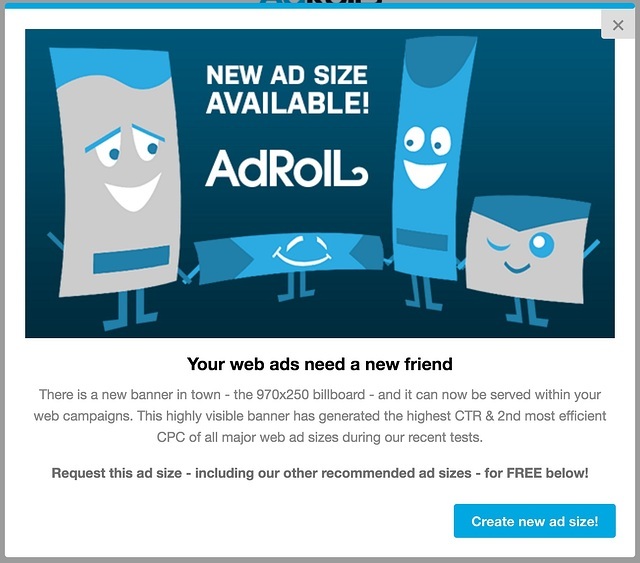 Retargeting ad tech pioneer, AdRoll, has reached the ‘Scale’ stage of growth. In a tech company’s ‘Scale’ stage—which according to Sean Ellis comes long after product-market fit and on the coattails of organic growth—they become focused on optimizing elements of their product to maximize their return. The tricky part of growing at this stage is that it requires the implementation of new tools and processes. This can be a challenge for companies the size of AdRoll, who continues to expand beyond 500 employees. AdRoll, however, does a great job adopting new mechanisms for growth, and this effort can largely be attributed to one team, Growth, ran by Peter Clark. Peter was brought on after AdRoll acquired his company userfox in 2013. Since then, he has tapped both internal and external resources to build and support a growth team focused on implementing small-scale optimizations into the platform. These optimizations are aimed at improving user activation and engagement of AdRoll’s core and new product offerings. The frequency of growth experiments don’t line up well with the frequency of development sprints; growth experiments required more rapid iteration. Engineers generally add greater value by improving features and products that are core to their user experience than they by implementing growth experiments that are often unsuccessful. Peter knew he wanted to use a modal window pattern to experiment with communications to users, but he didn’t want to take up engineering resources to build them each time. At this time Appcues was still in Alpha stage and had not yet gone public with it’s story. 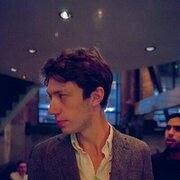 Unable to find the right software, Peter considered building a solution to implement scalable in-app tests. 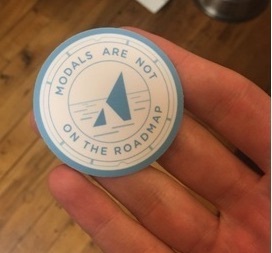 “We were pretty close to building a tool to create and launch modals into AdRoll ourselves! We hadn’t scoped much of the internal tool yet, but I remember starting down the rabbit hole of requirements and finding that the list grew intimidating really quickly. Hurdles like user targeting, permissioning and analytics made the build vs buy decision easy…At some point in scoping our modals out, our VP of Engineering, Patrick Mee, came to me and asked “are you sure this does not exist as a self service product?” I swore to him that I had searched everywhere and found nothing—and I had!—but I agreed to look one last time. And of course instantly found Appcues! 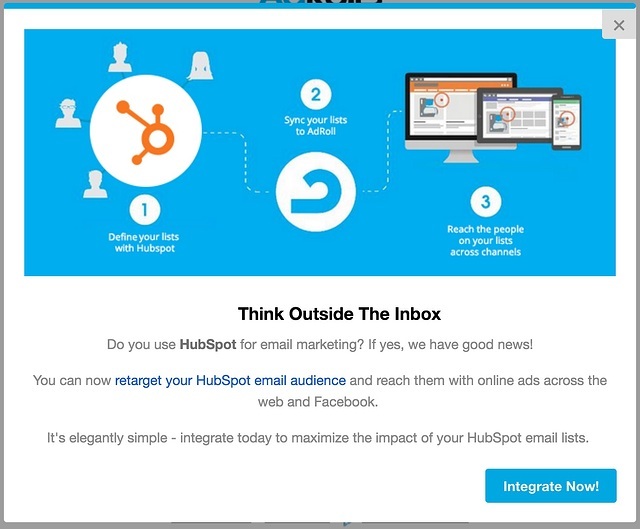 The growth team at AdRoll loves Appcues’ modal window pattern. So much so that they’ve given 18 team members access to Appcues and have 33 modal windows—targeted to different user segments—live in their product to-date. AdRoll uses Appcues for a variety of purposes. They use Appcues to get users to turn on new features such as their Instagram ads, to prompt new users to schedule time with an onboarding expert, to ask for and collect referrals from active users, and to announce new platform integrations such as MailChimp, Salesforce and HubSpot. AdRoll does all of this in 5 or more languages, and they roll out new content every week. 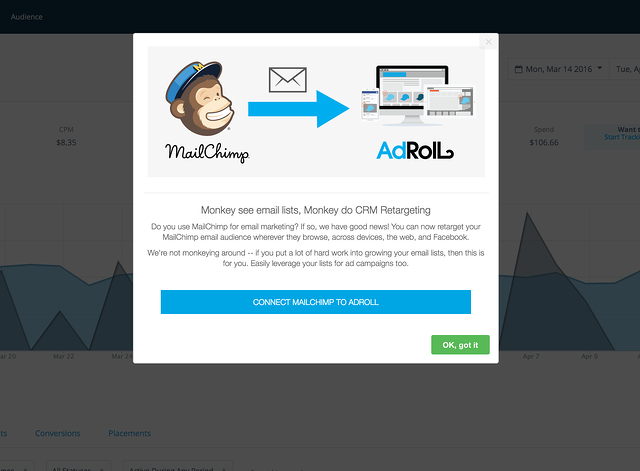 Before using Appcues, AdRoll’s MailChimp integration was sorely under adopted. 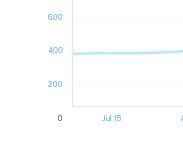 The week over week growth rate was flat and the amount of customers using it hovered around 400, but no new people each week had turned it on and reaped the benefit of being able to re-target their MailChimp email subscribers with AdRoll retargeting ads. To get more people to activate the integration, Peter’s team first isolated a list of users of both platforms using a tool called Datanyze, then pasted the list into Appcues, and—since they push their user data into Appcues for targeting purposes—set their content to be shown only to users of both platforms. 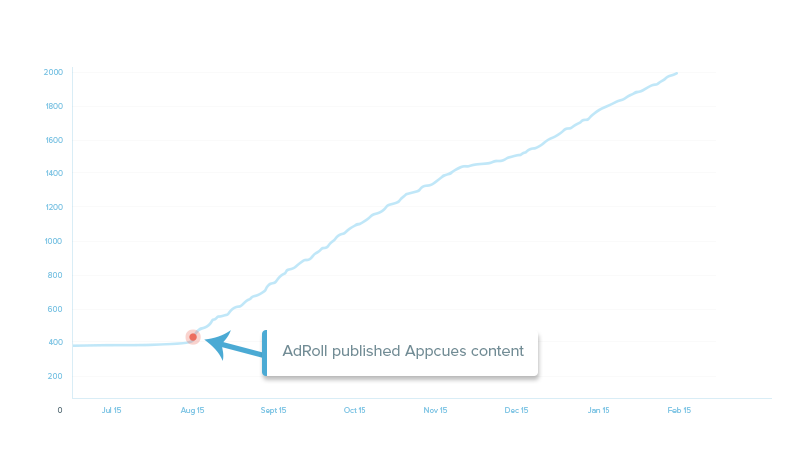 While AdRoll often chooses to lead with an in-app message, they’re easily able to follow up to inactive users who might miss out on their Appcues content. In the case of the MailChimp announcement, Peter’s team exported a list from Appcues of users that saw the modal, pasted it into their email service provider, and used it as an exclusion list to email users that hadn’t seen the modal after about a week. 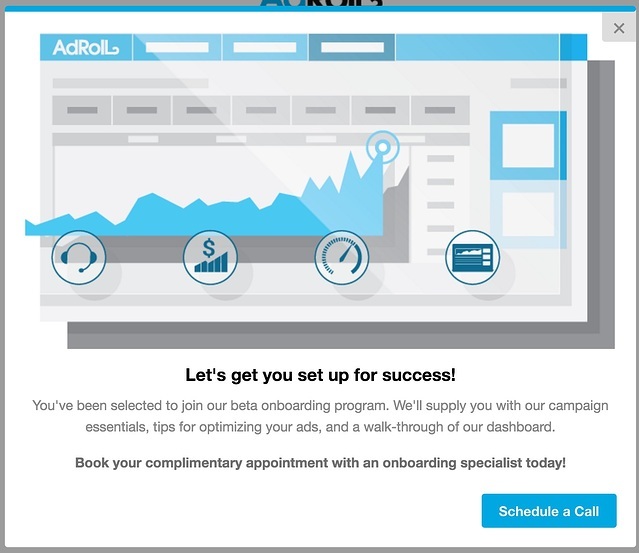 AdRoll has mimicked this success across dozens of other campaigns, such as creating conversion segments, launching Facebook retargeting campaigns, and of course, driving adoption for their dozens of other CRM Retargeting Integrations. As Peter remarked, “on average, 20% of people that see our Appcues modals go on and complete the goal no matter the nature of it, which is an insanely high completion rate especially when it comes to forms.” Given its direct outcomes on their user behaviors, Peter and his team continue using and experimenting with Appcues for all kinds of growth initiatives. AdRoll continues experimenting and testing the limits of modal windows all the time. They are increasingly using modals for user surveys and even experiment with showing modals to internal employees for an entirely different purpose. 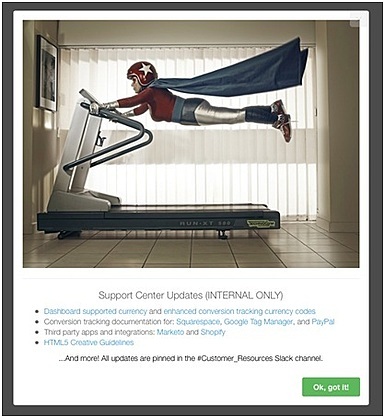 Internal communications on changes and updates to the support center are published in an Appcues modal to employees, rather than via another team-wide email.